On Saturday evening, as part of Bridging: A French-American Dialogue on Diversity and Inclusion in the Arts, George Emilio Sanchez moderated a talk at Gibney Dance Center, immediately following the 5pm performance of French Vietnamese choreographer Anne Nguyen’s Autarcie (…) (reviewed by Cory Tamler). Co-presented by Crossing the Line and Dancing in the Streets, the talk, titled Towards Cultural Equity: The Artist’s Perspective, included Nguyen, choreographer David Thomson, hip hop legend Ana “Rokafella” Garcia, and French writer and director Mohamed El Khatib. On October 15th, The Institutional Perspective will be offered at Baryshnikov Arts Center. The dominance of a marketplace mindset became apparent in the way the American artists responded to the ideas of equity as opposed to their French counterparts who seemed more focused on increased representation and artistic agency. However, in the midst of a 6 shows/4 post-shows week, the nagging question of autonomy (in this age of extreme capitalism and policing) dogged me throughout the talk. Equity implies either value or fairness, or fair value. Cultural equity would seem to point towards equally valued artistic work. If there was one thread running through Croatian artist Bruno Isakovic’s group version of Denuded (I reviewed his solo version) at La Mama as part of Queer New York International Arts Festival, the “identity-based” works at a 92nd St Y Fridays at Noon, Danspace Draftworks, Jennifer Monson/iLAND’s in tow team, and Nguyen’s work it would be the desire to have one’s work viewed on its own terms. All artists want their work fairly valued, but more importantly to maintain the self-determination required to make art in a world with decreased respect for the value of cultural efforts. Artists, and especially underrepresented artists in America, seek not only to be included thanks to diversity initiatives, but to be free. However, this freedom can’t only live in a fiscal realm of stability or comfort. The freedom must involve a dissolution of labels, an expansion of recognized aesthetics, and a shift of who deems whether equity is achieved. Underrepresented artists need equity, not only in the sense of fairness but in the sense of equal shares in the collective landscape of art making. We need not only “a seat at the table,” but to host the party. To enjoy the simple pleasure of walking through the world without ending up face down or hands up, struggling to remain standing. No.. revise that… to enjoy that very simple pleasure that is walking through the world without a hint of the FEAR that one might end up down on the ground. To move freely through the world. The talk’s handout asked what is the “impact of cultural inequality on artists?” In this country, the differential that must be surmounted towards equity is tremendous and half-hearted initiatives remain insidious in that their positivist language and well-meaning keep us from direct confrontation and immediate action. The day before the talk, at Fridays at Noon at the 92Y Harkness Dance Center, one clear impact was the unrelenting imposition of bigoted thinking. Watching Orlando Zane Hunter, Jr. and Riccardo Valentine, of Brother(hood) Dance!, Aimee Rials, Johnnie Cruise Mercer and guest-curator Trebien Pollard negotiate a host of physical practices and personas in their respective works, the themes of forced and fluid identities became apparent. Hunter, Valentine and Mercer are tour-de-force performers who can mobilize classical, conservatory training while jumping in and out of ballroom styles (meaning “butch queen” not bolero), hip hop swaggers, Africanist polyrhythms, or opera. These guys ma-hoooo-ve through space and command our attention. They clearly love to dance, dance, dance but they also have to bios stating that they use “art as a vehicle for activism” or to “tackle issues resulting from a capitalist imperialist patriarchal white supremacist system.” What’s the impact of cultural inequality on artists? Might beatings, incarceration or death be one? Or should we stay within the safety of essentialism, exotification or othering? Or just keep the endless cycle that was emancipation, then civil rights, then multiculturalism and now maintains itself through new diversity and pluralism quotas, more meetings, panels and taskforces? As Thomson and I discussed prior to the panel, what do the metrics tell us? How do we quantify inequity? For Rokafella and Thomson, there was no escaping the material reality of getting by, scrambling to make rent or as Rok said to just “make it right, cuz things ain’t right.” But, to keep the conversation focused on funds and not freedom of movement is to undervalue the power of culture, of art, to champion a self-directed life and artistic practice. Pollard, as guest curator for FAN, had suggested recent MacArthur Genius awardee, poet Claudia Rankine, as a potential source for the artists on his program. Rankine’s Don’t Let Me Be Lonely and Citizen are missing from my shelves, shared so many times I don’t know who’s got them. Brother(hood) Dance! 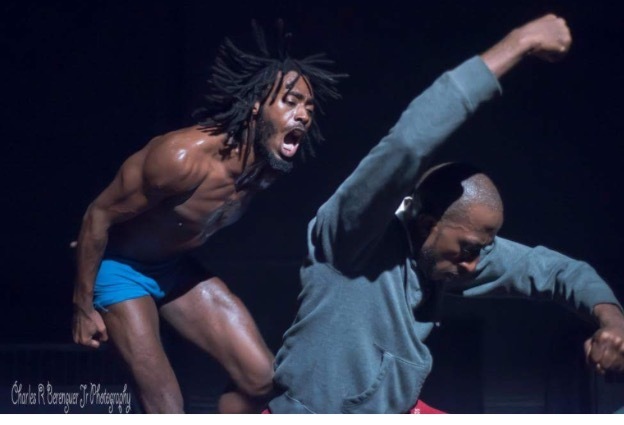 (the cover boys for Danspace Project’s Fall 2016 flyer – btw) used audio from her situational video “Stop and Frisk.” In an era when a presidential candidate, the presumed leader of one of our major political parties, cites “law and order” and “stop and frisk” as the answer to healing the racial divide, it’s quite clear that cultural inequality has an impact on the basic constitutional rights of too many of our citizen/artists. During the talk, El Khatib, via translator, very pointedly highlighted the power of language in any effort for change. When he detailed the experience of his sick, non-French-speaking mother’s attempt to seek out appropriate health care options, he offered one of those very specific realities of an immigrant experience that funders, presenters and critics may never consider in their valuing of individual artists. Claudia Rankine’s potency lies in her inclusion of personal experience, political strife and mastery of English. She makes it immediate and real, but also poetic. She summons a powerful brew of literacy and personal pain. Cultural inequality both erases the underrepresented and demands explanation from artists outside of white, heteronormative, ableist, bourgeouis norms about their worth, but only in the languages (verbal or physical) of the dominant culture. It also tends to demand that their work remain related to their outsider status, as so evisceratingly noted by Raja Feather Kelly in a recent Facebook post where he jokes about the expectation that as a queer, black man his work should be “about” his queer-black-male-ness. That is not equity, because it’s not freedom. It’s tokenism. It’s clear every presidential campaign that the middle class matters, but when artistic producers continue to adhere to those values equity cannot be achieved. In contemporary performance, we must continue to seek out the “non-native speakers” or, as I would often say on behalf of the Bessies “Stretching Boundaries of a Traditional Form” (don’t get me started) subcommittee, the “bi-linguals” like Anne Nguyen. At Gibney, Autarcie (…) managed to keep the face-to-face aesthetics of a battle culture form while negotiating the challenge of concert stage, but more importantly her work, according to Simon Dove, had previously stopped traffic in The Bronx and dragged tourists away from their phones and into the cypher amidst the crush of Times Square. When more artistic practice outside of the concert stage can find support and funding, we will easily encounter artists who offer new perspectives. We will avoid the demand that they align directly with the dominant values of contemporary performance. It isn’t enough for presenters to change the palette of artists on their roster, we must seek out new avenues for dialogue and presentation. We must continue asking artists to work with artists and to pull curatorial controls out our theaters and into a diversity of communities, to bring art into the world, to dance in the streets.